Recent changes adopted by many states regarding taxable income apportionment require attention from business taxpayers filing returns in multiple jurisdictions. Some taxpayers may realize at least a temporary windfall when they implement these changes, while others may see their tax bills rise significantly. How these new rules will ultimately be interpreted in each state, and the mix of states in which a taxpayer is taxable in the future, will in large part drive which taxpayers are winners and losers. Taxpayers who fail to monitor and plan for these changes may be whipsawed for failure to comply in the short run. Intended to bolster business tax revenues, about 25 states have adopted some form of single factor “market sourcing” rules in recent years to apportion service and similar types of income earned in multiple jurisdictions. In addition, regulations requiring market sourcing have been proposed by the Multistate Tax Commission. Generally, under this method, service income is sourced to the state where the service is delivered, where the benefit of the service is received, or where the project is located (“the market state”). Under previous rules, revenues were usually apportioned to the state where a majority of performance costs were incurred. (In general, revenues apportioned to a state are divided by total revenues of the business to determine the percentage of total taxable income taxed in that state). For example, consider consulting services performed primarily in Massachusetts with respect to a property being developed by a Rhode Island developer in RI. Assume that initial proposal and scoping efforts physically occur in RI, creating nexus for the service provider in RI. Because MA now requires market sourcing, the income from those engagement fees would be sourced outside of MA. Conversely, because RI still employs cost of performance apportionment, the same feeds will be sourced outside of RI. Result: the revenues are not apportioned to (and are in effect not taxed in) any state. The Commission and many states have adopted so called “throwback rules” intended to avoid this result. Throwback requires that, if the taxpayer is not subject to taxation in the state of benefit, the revenues must also be excluded from the denominator of the apportionment fraction, essentially negating the effect of that sale on overall apportionment. This rule works on behalf of a state when the taxpayer has performed no physical or economic activities in the market state to create taxable nexus there. In the above example, because RI nexus and jurisdiction exists but RI does not choose to impose the tax, the revenues are arguably not subject to the throwback rule. Now just reverse the facts, so that a RI developer is engaged on a MA project. Both states would likely find nexus to tax the consulting firm, and both states would treat the revenues as includible within its state for apportionment purposes, creating the potential for combined state apportionment percentages that exceed 100%. If all states adopted the same market sourcing apportionment rules, the above anomalies would no longer exist. But long-standing efforts to gain consistency across all (or even the large) states have been unsuccessful. No one can be sure how long this jumble of state laws with potentially uneconomic results will last. Note that some states will not require a tax return be filed if a company that is otherwise taxable has revenues below a threshold level set by the state. Or, many businesses will just choose not to file a tax return in a state where the taxpayer has nexus, but low visibility and acceptably low tax exposure. For smaller businesses, those factors could also allow effective exclusion of taxation in both states, depending on whether states choose to clarify their throwback regulations to eliminate that result. Note also that some states have “catch all” provisions that allow a more “accurate” method of apportionment to be imposed at the state’s discretion, but such provisions are expensive to enforce. Can taxpayers just ignore this complexity and uncertainty until it is resolved? Well, any resolution or mitigation may take a long time. If a taxpayer facing unfavorable taxation fails to comply with the current mix of rules state by state, that taxpayer faces unreported liabilities, plus potential interest and penalties. If the taxpayer would benefit from the current environment, that taxpayer needs to analyze and file on the most favorable basis to obtain the advantage. Taxpayers should perform enough analysis of the effect of these new rules to understand their options and adopt a filing strategy. This analysis may need to be updated annually, if the taxpayer starts business in new states, or states in which the business operates change or clarify their apportionment rules. And do not underestimate the complexity of other facets of state taxation not covered in this article, including the rapidly evolving definitions of activities which may cause nexus in each state. Ultimately, an informed understanding of the latest tax rules is needed to make good decisions about how to manage state tax exposure. Brian Monbouquette works as a fractional CFO and tax adviser for clients of The Fahrenheit Group, based in Richmond, VA. 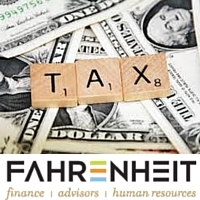 Please contact Brian at brianm@fahrenheitadvisors.com or a state tax specialist for further information about this subject.